Tips and techniques: Taste the white wine sangria and adjust for your liking. I like a lot of lime, you may like more or less. Or you vary the fruit like oranges or a mango even. This recipe is not rigid, have fun with it. 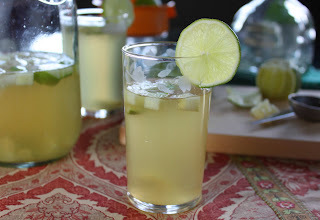 Many Sangria's call for ginger ale or 7-up for the addition of bubbles including my classic red wine sangria; I wanted a cleaner flavor with the tequila and felt these would be too sticky and sweet for my tastes so opted for a club soda. But again, make it your way and make it yours! One final thought is that pineapple juice could be substituted for the apple juice, this will mask the tequila a bit and give an even sweeter drink- if you prefer. Mix the wine, tequila, lime juice, sugar and apple juice in a large pitcher. Stir to dissolve the sugar. Dice the apple and lime, place a scoop in each serving glass and the rest in the pitcher. Fill each glass about 2/3 full, top off with a little pour of club soda. Serve immediately. I made this drink for a friend's BBQ. It was a big hit and we tried both the club soda and 7up. Preference depended on taste and I liked the 7up because it was a bit sweeter. Thanks for the great twist on a classic. My mom would love this. Nice post Monique! @D6- Glad you tried both versions and stuck with your preference! @Jeff- thanks, I like your Mom's taste!